Believe it or not, Patrick Mahomes is still incredible at his job. Facing second-and-one and with an all-but-free down to play with, the Chiefs, and Mahomes, chose to be aggressive and get fun. 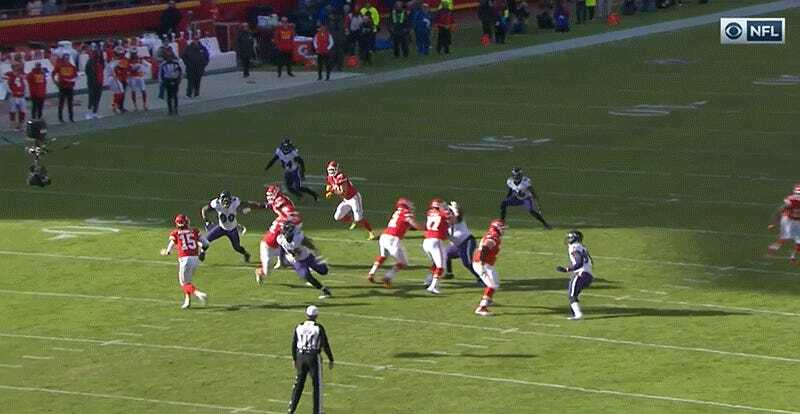 As Mahomes was scrambling away from Ravens defenders in the pocket, he looked right while whipping the ball back to his left to an open Demarcus Robinson; the result is this mesmerizing highlight. This isn’t the first time that Mahomes has pulled off this amazing feat. He first flashed the ability against the Broncos last year, and pulled a similar feat earlier this season against the Patriots. Later in the game, on a second-and-long situation, Mahomes was back to making arcade-style throws with an absolute laser of a pass for a 17-yard completion to Travis Kelce. Unfortunately, Andy Reid would rather see his team gain a first down because of a penalty (defensive holding on Baltimore) instead of letting his human highlight reel of a quarterback’s plays count.